A young couple finds a mummified corpse in the walls of the house they just bought. Prentiss sends Rossi to South Carolina to check out the mummy on his way back from Savannah. Unknown to his teammates, he had spent the weekend with ex-wife Krystall. The house belonged to a couple who were hermits. The walls were filled with mummies, seven in total, all more than 10 years old. Lewis and Reid attempt to interview Dorothy Elgin, the woman who had lived there. A couple of newer bodies were found nearby. Another woman. Mary Brewer. gets abducted by the unsub. Dorothy grabs a knife and stabs herself in the neck and dies. Lewis finds a box of letters from the original set of victims in Dorothy's room. 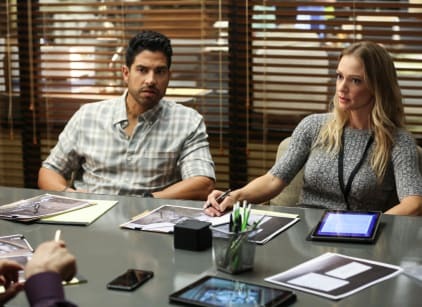 Prentiss discovers that Dorothy had a son, who is the new killer. The unsub has Mary sing him a song because he's sad. The victims in the letters said the Elgins treated them like their own daughters. The unsub wants Mary to feed him like a baby. LeeAnne Garrity was the Elgins' daughter, who ran away at 16. The Elgins were trying to replace her with the runaways. A murder-suicide of the neighbors at the time LeeAnne ran away was staged, Reid and JJ decided. LeeAnne got pregnant by the neighborhood boy who was killed. LeeAnne's son grew up in the Elgins' house and witnessed the murders. He started killing after Karl Elgin died. Mary stabs the unsub in the chest, then hides in a closet, where she is spooked by another mummy. Prentiss is trying to find Karl's fishing hole, which has a cabin nearby. Matt and Rossi capture the unsub. They dig Mary up from under the floorboards. JJ gives a letter to the sister of one of the victims. Krystall's daughter Portia introduces Rossi to her new boyfriend. Sheriff: The [cadaver] dog looks like it's confused. Rossi: The dog isn't confused. It's overwhelmed. Permalink: The dog isn't confused. It's overwhelmed. Krystall: The wounds are fresh right now. Rossi: So [Portia] doesn't want you sleeping with the enemy. Permalink: So doesn't want you sleeping with the enemy.